The Diablo inTune is the latest and greatest handheld tuner on the market today. DiabloSport created the inTune to be the most affordable, fastest, versatile, and easiest to use handheld flash tuner on the market. Each DiabloSport inTune comes pre-loaded with DiabloSport's famous "canned" tunes that are pre-configured from countless hours of dyno engineering and road testing by ex-OEM Calibrators to extract the most out of your vehicle. Furthermore, the inTune will appeal to advanced users that want to tweak more out of their vehicle or other aftermarket parts using the vehicle specific "Adjustable Parameters" or work with a certified DiabloSport CMR dealer/dyno tuner to create and download a completely custom tune into your DiabloSport inTune. The inTune by DiabloSport also offers you OEM-Level diagnostics (code reading and clearing) and vehicle data-logging capabilities by using its over 1GB (gigabyte) of internal memory. By purchasing the inTune you have the highest quality tunes, most advanced technology, cutting edge software, easiest to use interface, and the DiabloSport brand name you can trust. The inTune flash programmer is designed to be one handheld part number that supports hundreds of different vehicle applications. This means that, while you only get license to tune one vehicle at a time, you have the flexibility to keep and re-use this item when you change vehicles. All you have to do is return the first vehicle back to stock and the inTune will be unlocked and ready to install on your next inTune-supported vehicle. This feature adds value by saving you from having to sell and buy another part number to support your new vehicle application. Don't worry about software updates for that "other" vehicle either, because those are free. DiabloSport designed the inTune handheld programmer color touchscreen interface and menus to be simple and straightforward. Furthermore, they have designed the inTune flash tuner with a built-in user manual and help sections so that using the inTune is fun and efficient. Unlike older technology flash tuners, the Diablo Sport inTune handheld programmer is designed to act like an external hard drive when it is connected to your PC (USB cable is included). So, just like when you connect a digital camera card or thumb drive to your PC, the inTune tuner will install all the necessary drivers by itself to quickly and easily allow you to use it while connected to your PC. This feature streamlines issues like extracting your original backup vehicle software, installing CMR dealer custom tunes, updating the inTune flash tuner software, or exporting and viewing a datalog recorded from a recent test drive. Advanced users will appreciate this feature the most. By having a large amount of memory the inTune flash tool can record data from longer test drives, gather input from more vehicle sensors (PIDs) during that test drive, and also install many custom tunes to change between. Diablo Sport designed the inTune handheld tuner to be about 10% smaller than your average smart phone. This makes it easy to carry in your pocket, glove box, center console, or in a drawer in your office. The cord is detachable and there is no separate battery or power supply needed. It uses the power supplied by your vehicle's diagnostic port when plugged into your vehicle for use. When connected to your PC, the inTune vehicle programmer will run off of the power supplied through the USB connection. The Diablo Sport inTune handheld programmer is small, convenient, and efficient. The Diablo inTune automotive tuner will also serve as a diagnostic code reader/scanner that will allow you to read and also erase trouble codes. You no longer need to pay a local technician to read and erase a diagnostic code to turn off that annoying check engine light. Advanced users will also appreciate the previously mentioned data-logging feature that allows you to record vehicle sensor data during a test drive. Being able to record and review what the vehicle is doing during a test drive can help diagnose an issue or improve performance further by giving the advanced user or technician the information they need. The amazing thing about DiabloSport's tuning platform is that they offer a solution for the novice and advanced users within the same inTune interface. The novice will probably stick with the inTune vehicle programmer supplied "canned tunes" for their vehicle. The advanced users may have a desire to test and tweak their vehicle settings. The DiabloSport inTune's adjustable parameters help to satisfy the advanved user's desire to make their own adjustments to their vehicle such as re-calibrating the speedometer for a different or new tire size or gear ratio. Or maybe you want to tweak the shift settings of your automatic transmission or fuel and spark timing to your liking. While the exact list of parameters and specific adjustments available will vary by vehicle application, rest assured that the inTune will offer most users what they are looking for to meet their needs. If the list of adjustable parameters doesn't meet your needs, you can always contact a DiabloSport CMR dealer to have a custom tune made for your setup and you can easily upload that 3rd party CMR tune into your inTune handheld through your PC. The Diablo Sport inTune allows you to hook up an analog input from a sensor such as wide band oxygen sensor or EGT (exhaust gas temperature) sensor, etc. DiabloSport equipped the inTune flash tuner with dual processors to make the flash programming process as fast as possible. Every user wants to minimize the time it takes to install the software and enjoy the drive afterward. The dual processors help to make that a reality. DiabloSport is known for their tuning prowess. The inTune flash programmer includes pre-configured, dyno engineered, and road tested tunes for your specific vehicle. Although there is only one inTune handheld part number for a wide range of vehicles, the inTune vehicle programmer is pre-loaded with all of the software settings and tunes to maximize your vehicle's performance. This is a common customer concern. 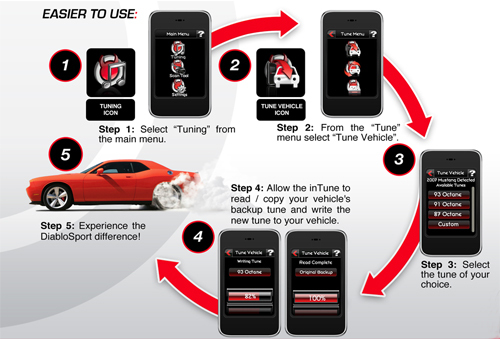 It works like this - after the inTune handheld tuner reads your vehicle's PCM software, it identifies which vehicle you have and the software strategy and then automatically installs the correct DiabloSport performance settings based on the "tune" you selected. These tunes are designed by Diablo Sport engineers after countless hours of dyno and road testing to increase power, torque, and driving dynamics. And, in case you want something more, the previously mentioned adjustable parameters can be used to tweak these "canned" tunes to tailor them to your needs. Remember, this is more than just a set it and forget it delivery device that you will never use again. It can be if you want to just install the canned tunes and leave it at that, but most users will appreciate the fact that the DiabloSport inTune handheld is also a tool and not just a delivery device. This is a fancy term but it is designed to simplify use and installation. Basically, the Diablo Sport inTune uses this new technology to automatically evaluate your car's PCM and provides you with all of the available tunes and settings for your vehicle. This technology is necessary to make the DiabloSport Intune compatible with various makes, models, and years within one part number. Another common customer concern resolved by the DiabloSport inTune vehicle tuner. Unlike some of the competition's products, the inTune performance tuner does not leave any footprint, fingerprint, watermark, trace etc. on your vehicle's PCM after you return the vehicle back to stock. This means that if you return your vehicle back to stock by restoring the original backup recorded by the inTune flash tuner, the dealer will not be able to see that the inTune was ever installed. This important feature will allow the technician to perform an honest and thorough diagnosis for the warranty repair without the worry of service drive finger pointing. You are also able to take advantage of DiabloSport's US based tech support personnel. Unlike the current trend for US companies to use offshore tech support call centers with personnel that you can barely understand and that use made up names, Diablo Sport includes free tech support by phone, email, and online forum. And the DiabloSport technicians are not some 3rd party call center with no knowledge of the inTune. These technicians are located in the same building where your Intune was designed and built and where the tunes made for your vehicle were developed. As new features, vehicle tunes, and vehicle applications are developed, improved upon, and released, you can take advantage of them for free. Online updates are easy too. The DiabloSport inTune will automatically check with DiabloSport for any updates when you connect it to your home or office PC using the included USB cable. The DiabloSport inTune performance handheld tuner is built with stainless steel construction using the latest in technology and cutting edge software. Every DiabloSport inTune that DiabloSport produces is individually tested, not batch tested like the competition, to ensure the lowest defect rate possible. The tuning software included in your DiabloSport inTune is developed by ex-OEM calibrators that use a state of the art facility to bring you the most powerful, safest, and reliable tunes available today. Plug the included OBD-II cable into the OBD-II connector of your vehicle located under the dash. 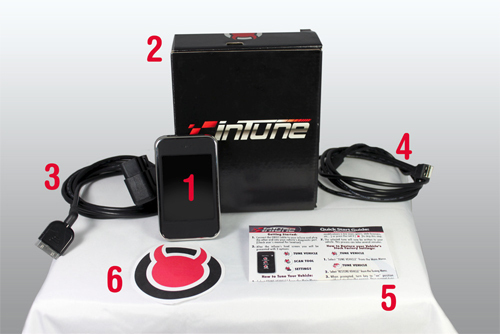 The DiabloSport inTune will turn on and boot up the software. Using the touchscreen interface with your finger, select "Tuning" from the main menu. From the "Tune" menu select "Tune Vehicle". Select the tune of your choice. The DiabloSport inTune will then write the new tune you selected to your vehicle. After installation is completed, you can disconnect the cable, start the car, and enjoy the driving experience. You do not need to keep the Intune connected to the vehicle after the installation process has been completed. The new tune you installed is saved by the vehicle. You can return the vehicle back to stock at any time by simply reconnecting the DiabloSport inTune to your vehicle and selecting "Restore Vehicle" under the Tune Menu. Excellent product worked right out of the box with no issues. Truck responded well with new tune. Fast shipping and great price! What a great upgrade to my Ford F-150 Limited! Feels like a Race Truck accelerates with just a light Foot on the gas Pedal!! Can't wait to Push it Down on the Highway! Great Job Ford! We Di It Right!